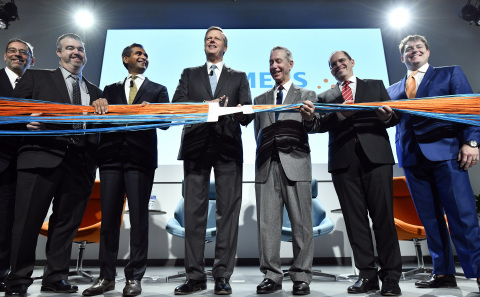 Siemens Healthineers invested $300M in the Walpole, Mass. laboratory diagnostics manufacturing facility bringing up to 700 local, high-tech jobs to Massachusetts. The facility manufactures assays for the company’s next-generation laboratory system, the Atellica® Solution. In total, Siemens Healthineers provides more than 10 billion laboratory diagnostic tests globally each year. WALPOLE, Mass.--(BUSINESS WIRE)-- Siemens Healthineers largely completed the expansion of its Walpole, Mass. manufacturing and R&D facility and celebrated with a ribbon cutting ceremony today. This milestone means additional, high-tech jobs will soon be available. As of December, the company has created more than 275 positions of its commitment to hire at least 400—meeting 70 percent of its target goal in just over two years. The Walpole facility currently employs more than 900 employees and is the main Siemens Healthineers manufacturing facility for assays that run on the ADVIA® Centaur family of immunoassay instruments, and for consumables for the company’s molecular and blood gas testing instruments. The facility now also manufactures the tests for the immunoassay module of the Atellica® Solution.1 R&D efforts at the site bring new tests to the in-vitro diagnostics market to help physicians diagnose, monitor and treat diseases. Siemens Healthineers provides more than 10 billion laboratory diagnostic tests globally each year. The Walpole facility is a flagship Siemens Healthineers manufacturing and R&D facility for laboratory diagnostics reagents and devices. Laboratory test results affect 60-70 percent of all critical clinical decisions, such as whether to admit, discharge and/or initiate therapy for a patient. Siemens Healthineers enables healthcare providers worldwide to increase value by empowering them on their journey towards expanding precision medicine, transforming care delivery, improving patient experience and digitalizing healthcare. A leader in medical technology, Siemens Healthineers is constantly innovating its portfolio of products and services in its core areas of diagnostic and therapeutic imaging and in laboratory diagnostics and molecular medicine. Siemens Healthineers is also actively developing its digital health services and enterprise services. In fiscal 2018, which ended on September 30, 2018, Siemens Healthineers generated revenue of €13.4 billion and adjusted profit of €2.3 billion and has about 50,000 employees worldwide. Further information is available at www.siemens-healthineers.com.